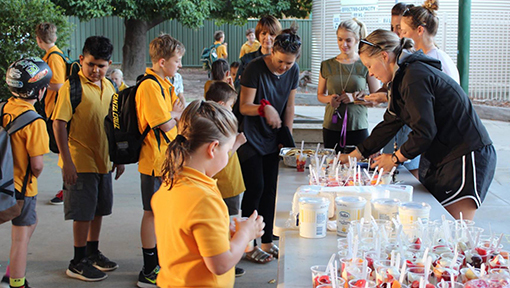 As part of Echuca Primary School’s student engagement and wellbeing philosophy, we provide breakfast for students Monday and Thursday. Generally, this consists of toast with a spread and fresh fruit. On occasions, we serve other specialities such as pancakes, yoghurt and ‘surprise’ menus. We view Breakfast Club as an opportunity to meet the needs of students so they are ready for a full day of learning. Breakfast Club is also another valuable avenue for staff to build essential relationships with students. We do rely on generous donations from our local community and businesses.